If you're a Doctor Who fan, then you know that this weekend was pretty awesome. 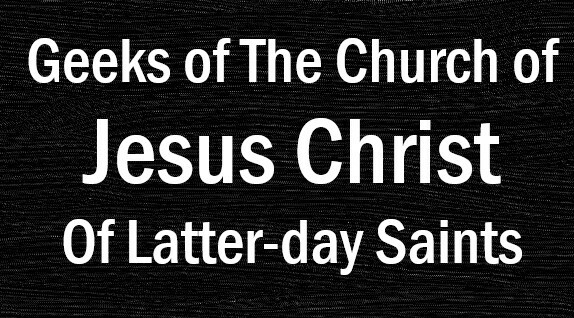 If you're not, then I'm sorry. I'm so sorry. By the way, proceed through this post with caution. 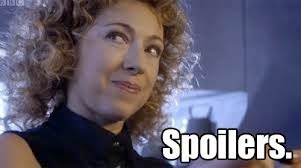 Because...well...I'll let River tell you. BBC America has been showing a lot of Doctor Who in the past few weeks. This past week has been a marathon from Donna to Amy to Clara. And then came the awesome re-airing of Day of the Doctor. (Okay, they showed it like 3 times this weekend, but still.) Personally Day of the Doctor is one of my all-time favorite episodes in the whole series. Of course, my wife and I had to rewatch both Day of the Doctor as well as Time of the Doctor. And before I get to the newest episode, let me point out two things I found interesting from these episodes. 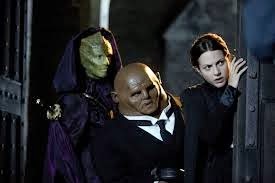 First: In Time of the Doctor, shortly after discovering the crack in the wall in the town of Christmas, the Doctor says he has a seal that he stole from the Master in the Dead Zone. The first time we watched this episode, I had no idea what that meant. 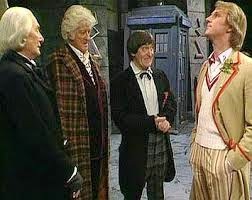 But thanks to a friend, I was able to watch The Five Doctors, which has the Master and all the Doctors at the time (minus 4 sadly enough) in the Dead Zone. The Time Lords wanted to prove that the Master was helping them so they gave him the seal. #11 states that he stole the seal off the Master at this time. Just thought it was awesome how they brought it back into play. Second: When I first watched the Day of the Doctor, it was awesome to see Tom Baker as the curator. Even though we all know/hope he was somehow a much older Doctor. His vagueness in speech is just enough to make one believe he really is the Doctor. But....let's back up toward the beginning of this special. Matt Smith is reading a letter from Queen Elizabeth I. In that letter she says something quite interesting. She names the Doctor as the curator. What better position for the Doctor to retire into as the curator and somehow change back into some of the old favorite faces. So, I'm not gonna speak so much as to Capaldi (pronounced Kuh-pal-dee, if you didn't know) in his portrayal of the Doctor, but more of the storyline aspect. More or less, this is just a list of items I found fascinating, intriguing, interesting. First, at the very end, we get a glimpse at what looks like the villain for this season/series. Someone quite interesting. But I can't go into much, because I don't know much. But it also means that Frankenborg will probably be returning at some point as well. ually address it other than "random casting" like they did with Colin Baker. 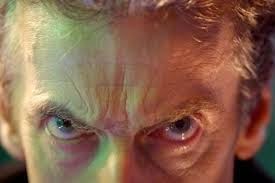 The Doctor's obsession with his eyebrows was pretty awesome. Third, we see that there was a reason the phone was off the hook when Clara walked up to the TARDIS at the end of Time of the Doctor. I like how they did that actually. It seemed as if they knew they were going to use that moment in the future, otherwise, her hanging up the phone seemed pointless. Plus, it was nice to see another moment for Matt Smith as the Doctor. Fifth, Clara acts as the audience member. I always see the companion's role that way, but this is quite true. Many people were against Capaldi's casting as the Doctor and claim it is difficult to see him in that role. But really, it's more trusting the whole show to not deceive us. Capaldi is our Doctor for now. So let's forgive Matt Smith for leaving and move on. Sixth, Clara utters one of my favorite lines that echoes back to the classic series 10th season premier: The Three Doctors. When the second Doctor is looking at the third's TARDIS he says "Ah, I can see you've been doing the TARDIS up a bit. Um, I don't like it." In The Five Doctors special, the second Doctor meets up with Lethbridge-Stewart and, taking a look around his office, he says "You've had this room redecorated haven't you? Don't like it." Fast-forward exactly thirty years to The Day of the Doctor when the TARDIS adjusts to #11's version. #10 looks around and says "Oh, you've redecorated! I don't like it." So it's no shock when Clara walks into the newly changed TARDIS, sees #12 (I don't count the War Doctor as anything more than 8.5) and says "You've redecorated." He says "Yes." And of course, she says, "I don't like it." I really have no idea what is in store for Capaldi's Doctor and my favorite companion. (Yes, Clara is by far my favorite of the Doctor's companions.) But I do know this will be another interesting series of episodes for what is probably BBC's most lucrative franchise.